SEAL Team Six aren’t quite real anymore, in fact, they haven’t been for a while. The unit was officially disbanded in 1987 and replaced with the United States Naval Special Warfare Development group. Being the military, this unit has two official designations, NSWDG and DEVGRU. Also being the military, it has a third name; SEAL Team Six. The idea of the unit has proved to be bigger, more important, than its official designation and, regardless of title, it remains one of America’s four Special Mission Units, dedicated to counter-terrorism operations. This work led them, on 2 May 2011, to the compound outside Abbotabad in Afhganistan where Osama Bin Laden was hiding, and to their execution of him. The moment that operation was public, the sense of unreality surrounding the team intensified. The intensely classified nature of their work, and the individuals involved only accentuated the public’s desire to know as much as possible about the events in Abbotabad and the men responsible and, within the year, three books, including one written by a SEAL Team Six operator who claimed to be one of the men who had killed Bin Laden was released. At the same time, Kathryn Bigelow’s movie, Zero Dark Thirty, came to light, bringing the controversy over how much access the film makers had to the team and the intelligence gathering that led to the assault, with it. SEAL Team Six have, for two years now, been in very unfamiliar territory, equal parts fact and fiction, ideal and reality, caught between their most famous operation and the fact that none of them are allowed to talk about it. Which brings us to SEAL Team 666. Weston Ochse’s novel revolves around a military unit older than America itself, a group of soldiers pulled from every part and ideology of the US, who defend it from supernatural threats and the very first one of those threats we see them face is Osama Bin Laden, or rather, the creature possessing him. Ochse clearly knows this is potentially very controversial territory and it’s absolutely to his credit that he sticks to his conviction with it. We see Triple Six, as they’re nicknamed, deploy as part of the Abbotabad operation along with SEAL Team Six, there as backup. We see Triple Six fight, and kill, the demons in the compound, lose a man in the process and extract. There’s no celebration, no glorification of what they’ve just done. It’s an operation. It’s done. Time to prepare for the next one. I’ve been close friends with several soldiers over the course of my life and this pragmatism, along with a jet black sense of humor, are the qualities they’ve all had in common. It’s also what Ochse uses to steer the book through a rocky opening quarter. The shock of the opening and the willingness to build fiction on this particular piece of recent history resonates for a while and makes the first section of the book beat its chest more than is comfortable especially as the lead is new recruit Jack Walker, a hard-working maverick who has a troubled past and a problem operating within the rules. Also introduced in this quarter, the female characters, get short shrift, especially Alexis Billing, the team’s government liaison who is dangerously close to an off the shelf hard-nosed bureaucrat. For a while the book seems to be heading towards the shallow end of the action pool. Then, something interesting happens, or rather, four interesting things happen. The first is Walker, himself, who Ochse begins to explore and develop in very interesting ways. Walker’s past, and the reason why he’s been recruited to Triple Six is both fascinating and horrific, and Ochse pulls absolutely no punches with either the horror or the fact that Walker has been deeply changed by his childhood experiences. His brutal, physical reaction to being in the presence of the supernatural also neatly sits him in exactly the same spot as the reader, as well as ramping up the jeopardy. Walker can barely move in the presence of the supernatural, and the fact that a Special Forces operator like him responds that badly drives home exactly how dangerous the work these men do is. Ochse neatly contrasts Walker coming to terms with these experiences with genuinely unsettling flashes of his childhood and it does a lot to both ground the character and raise the stakes. In the first quarter of the book he feels like a cookie cutter action hero. By the halfway mark he feels like a survivor, a man refusing to give in to the wounds his past has inflicted, and determined to make his life better. With the main character set on his way, Ochse also dives under the machismo of Triple Six to reveal something much more interesting; the fact these men are a family. The jet black sense of humour I mentioned earlier is very much in effect here, as Walker fits into the team and in doing so, discovers they’re all as odd as he is. These are men who are equal parts brilliant and fractured, and there’s an understated implication that they’re in Triple Six because they couldn’t be anywhere else. For example, Tim Laws, the team’s translator is both blessed and cursed with an audiographic memory, meaning that he remembers anything he hears. A lesser writer would have turned this into Laws being a walking Rosetta stone but Ochse isn’t in the habit of letting his characters off easy. Laws still struggles with written language and one of the book’s best moments comes when he locks himself in their offices for a night to drag a clue out of the intelligence they’ve recovered using just his brain, his memory and a lot of caffeine. This sequence alone is actually worth highlighting, because Ochse essentially pares all the action movie trappings away for a couple of chapters and has one of his characters solve a problem by thinking very hard. Not only that but we follows his process as he does it, meaning we’re still as invested as before. It’s a very brave thing to do, especially in a book like this and Ochse absolutely nails showing us Laws’ thought processes and the physical toll it takes on him. In fact, we get this sort of complexity for the entire team to greater or lesser degrees, with each one of these men finding their way to Triple Six by very strange roads. As the book progresses, they become likeable, interesting and nuanced, the reader learning more as Walker does. Which is, of course, the moment Ochse starts killing them. No one’s safe and he picks his targets very carefully, not only showing how dangerous this work is but how capricious that danger can be. Ochse picks his targets very carefully, not only emphasizing the danger of Triple Six’s work but using the aftermath to round the characters out. The reaction to the first death is particularly telling, and there are two moments of real emotional impact in this section that are considered, dignified and extremely powerful. The way Laws chooses to grieve is especially affecting, the team joker carrying far more weight than you think he is up to that point. Ochse never shies away from death, or its consequences and, even during operations, none of the team take any glory in what they do to other humans. The job, as Ochse present it here, is protecting your team and your country first, killing the opposition second. It’s a subtle distinction, verging on the apolitical, and again it’s something I’ve seen each of the soldiers I’ve known embody. One of those deaths leads to the introduction of Chief Petty Officer Ali Jabouri, a beat which is tied to the opening sequence in Abbotabad in two ways. It echoes the danger of that mission as another member of Triple Six is killed and secondly, it’s difficult not to see it as a response to the use of the Bin Laden assault in the opening chapters. Jabouri is a self-described moderate Muslim who joined up to prove that the 9/11 hijackers didn’t speak for every Muslim on the planet, and, unlike Walker, he fits in almost straight away. He’s quiet, dedicated and extremely competent and the only member of the team to have an expressed, practiced faith. In the hands of a lesser author, Jabouri would be little more than a token magical brown person, especially given the fact his open approach to the spiritual may have been part of the reason he was selected for the team. However, Ochse takes this foundation for the character and turns him into something much smarter and, frankly, more realistic. Once again, the apolitical nature of a lot of soldiers’ mindsets comes into play and Jabouri is an equal, rather than token representation. This is helped still further by his position as the team techie, traditionally the white nerd’s role in stories like this, and the fact he and Walker essentially share the spotlight for the closing chapters of the book. If Ochse flirts with disaster anywhere it’s most certainly here, but he makes it work and Jabouri is a vital, and extremely likable part of the second half of the book. Ochse’s take on the supernatural is not only red in tooth and claw it’s also surprisingly different to the norm. The team’s first mission, dealing with a Triad sweatshop involves an extended fight with a homunculus; a constructed lifeform that makes up for in strength what it lacks in size. The sequence is equal parts physical comedy and bruising horror as the tiny, fast, strong creature proves almost impossible for the SEALs to take down despite their size, training and equipment. It’s a mission statement for the rest of the book too; that the supernatural is never what you think it is, is never what you’re ready for and is always ready for you, a fact backed up by a later encounter with multiple homunculi that ends far less well. This willingness to not just canter through a shopping list of monsters but explore the implications of their presence in the modern world is a common thread, and the reveal of why that sweatshop is important is very smartly handled. A later sequence involving qilin, a creature present in several East Asian cultures is as surprising as it is horrific and the books’ exploration of how these creatures can be weaponized is smartly handled and extremely unpleasant. Likewise the reveal on who is responsible for the events of the book and why is an interesting take on martial beliefs not dissimilar to the team’s own, and is drawn from somewhere very different to what you’re expecting. The end result is a closing sequence that’s stripped of all the glamor that action movies tend to slather their boss fight in, instead combining spectacle with bloody knuckled desperation to create something which feels real, despite the supernatural elements. 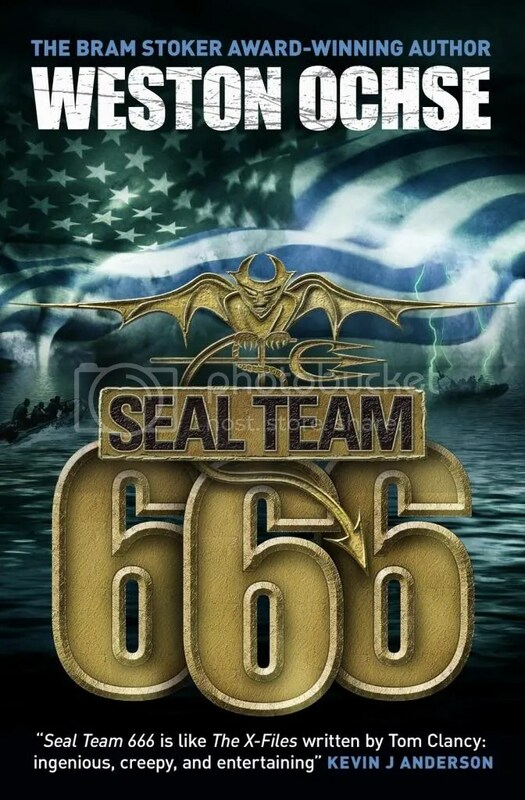 SEAL Team Six aren’t quite real anymore and SEALTeam 666 never were. The connection between the two could have been the recipe for abject disaster and Ochse has taken a massive gamble with his premise. Early wobbles aside, he’s created a superior piece of pulp fiction with intelligence, wit and a surprisingly different perspective, and enough hints to suggest sequels are planned. My initial concerns aside, they would be welcome, as Ochse does a great job of navigating the difficult course he’s set himself. He’s created a novel as likely to appeal to Supernatural or Buffy fans as it is Tom Clancy’s readers. Equal parts military thriller and supernatural horror, Seal Team 666 refuses to back down from any of the challenges it presents itself. The book is a smart, surprising, nuanced look at military life through a supernatural lens. SEAL Team 666 is published by Titan, priced £7.99 and is available now.